Check out the spaghetti squash which landed in our garden!!! 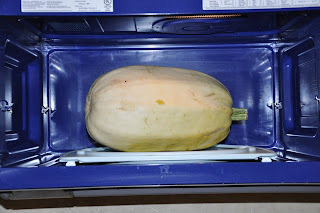 We only got one squash. Thankfully! 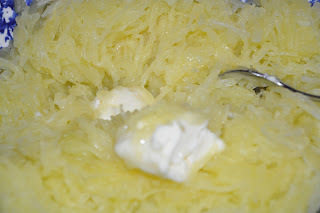 I made spaghetti squash back when Tim and I were first married as a low calorie alternative to pasta and served it with spaghetti sauce, but, with three teenagers and two "willing to starve if necessary" munchkins, I didn't think that basing my family's whole meal on a "low calorie substitute" would be a good idea. So we went with the side dish approach. 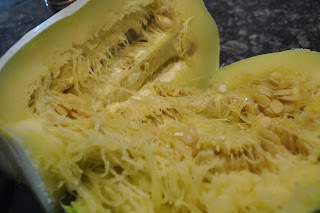 I must mention that this is Katie's squash. She picked out the plant at the nursery back in June, but unfortunately, though she tended it regularly, she wasn't around when the time came to cook it! So Lily stood in her place! 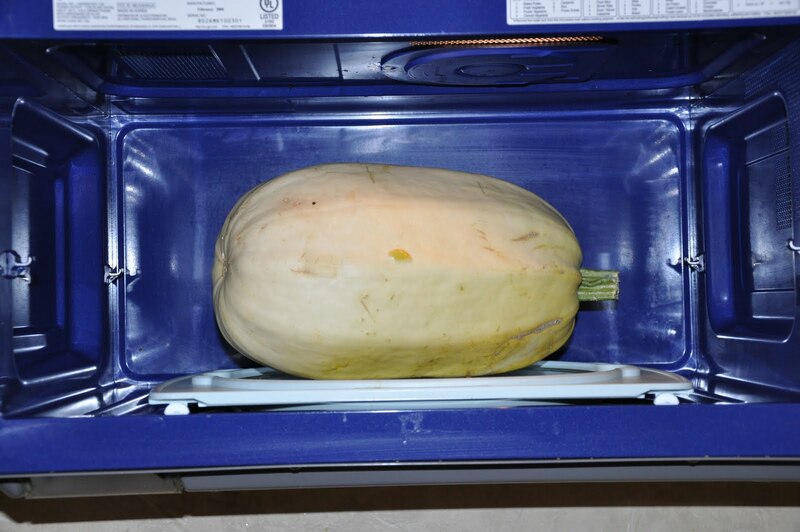 So anyway, cook the squash on high power for as long as it takes to get a little bit soft. 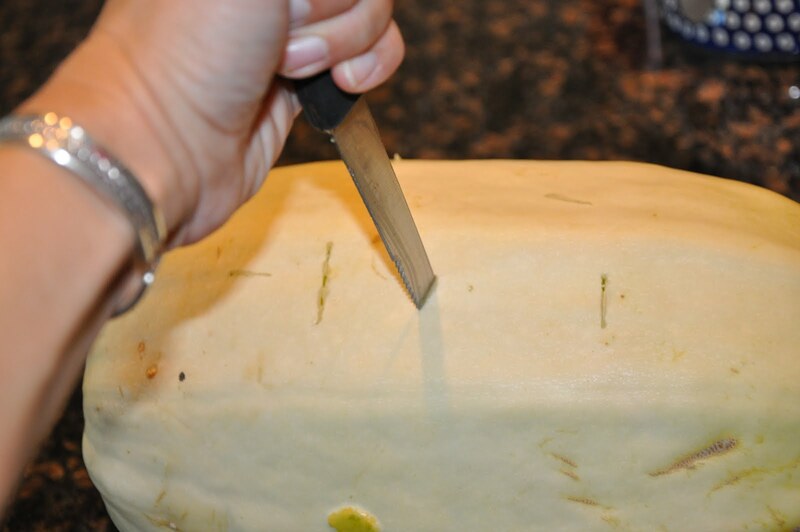 Remember the rind will remain stiff, but you can squeeze and see if the flesh is cooked. I think this one took about 20 minutes in the microwave. You can also do this in the oven, but it takes longer. Then cut it open and inspect the fun! If it's not soft, just put it back in the microwave for another 5 minutes. Scoop out the seeds. You can roast them like pumpkin seeds if you like. I didn't like. Scrape out the flesh. 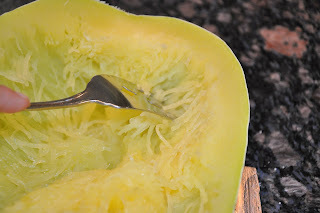 For spaghetti squash, the flesh comes out in long strings when you pull it with a fork. It's worth doing just for this part. At this point, you can serve with your favorite pasta sauce if you like. The squash has a mild, creamy flavor that pairs well with just about any italian application. But since that would have been too controversial, I just added some butter, salt and freshly ground black pepper, and called it a dish. And it was delicious. 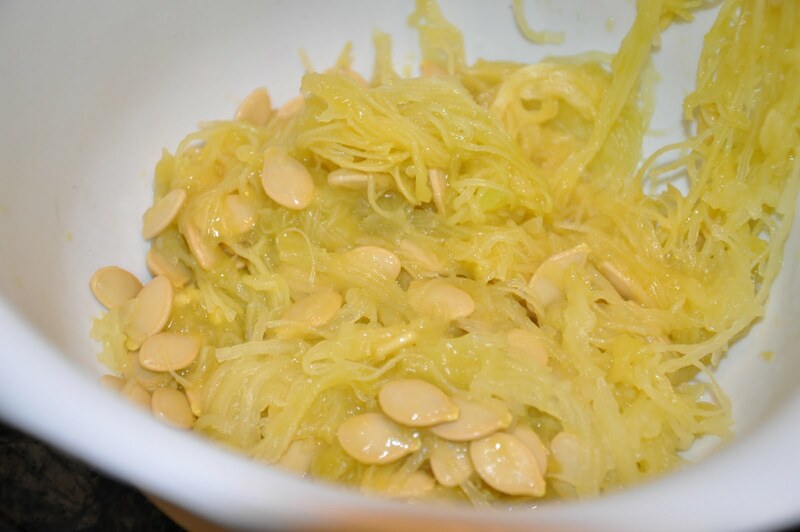 The spaghetti squash which you find in the grocery store are much smaller than ours...just so you know what you are looking for! Oh man that looks good. I love squash. Funny that is one thing I haven't seen here yet. Although I have seen lots of things here that I haven't there. Out of curiosity, how long does it take in the oven? Would I cover it with foil or add a bit of water? 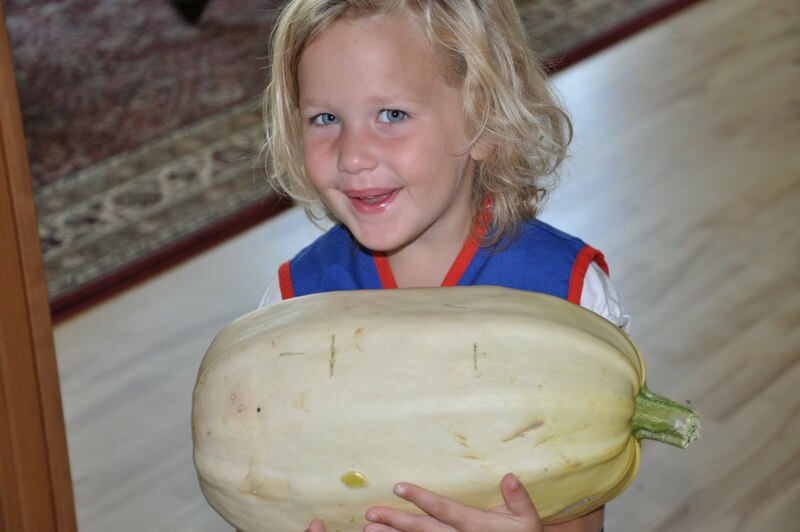 Jessica, it would really depend on the size of the squash. 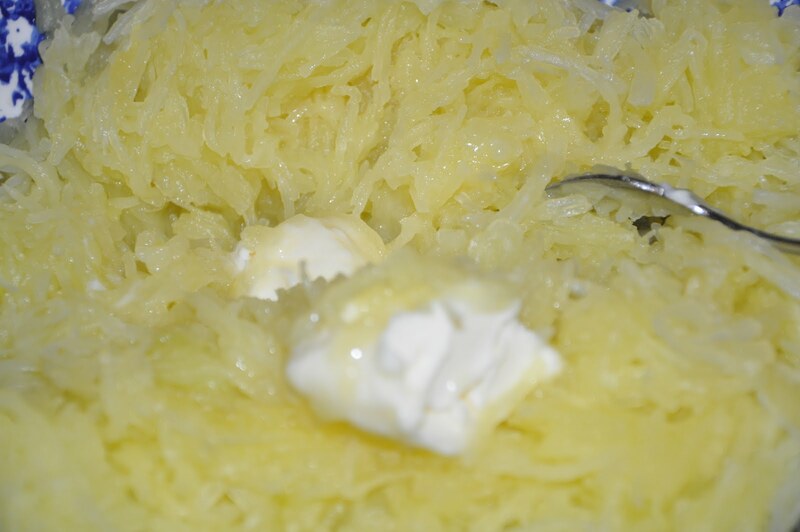 For a regularly sized spaghetti squash, I'd plan on at least 45 min. to an hour at 350. I've done them in the oven in a glass dish, and I've left them uncovered, but put a little water in the bottom of the pan just because it seemed like the right thing to do!